It was a Saturday in December and I was on my way to Masai country—Kenya. I left Toronto at 6pm, and boarded the plane for the six hour flight to Amsterdam. I spent all of Sunday in Amsterdam’s Schiphol Airport before getting on Kenya Airways for the eight hour flight to Nairobi. The long layover had nothing to do with a lack of flights to Kenya but was instead due to my poor travelling plans and preference to always take an Afrikan owned airline into Afrika regardless of the inconvenience—it’s my small way of helping the Afrikan economy. 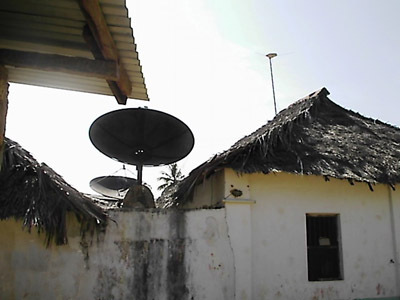 The ubiquitious satellite dish is on elegant thatch roofed village houses. I arrived in Nairobi early Monday morning but saw nothing of the city except for its airport, Moi International; I had another plane to catch within the hour to my eventual place of stay of in Kenya, Mombasa. Mombasa, whose original name was Mvita (island of war) is Kenya’s second capital city and an island of approximately 16 – 24km wide on the country’s southern border. Ferries and bridges connect Mombasa to the Kenya mainland. Northeast of the island is Somalia, to its south is Tanzania and at Mombasa’s east is the East Afrikan Ocean (disingenuously named by Europeans as the Indian Ocean). In the early 11th century Mombasa’s proximity to sea fairway made it ideal for a thriving trade with Oman Arabs, Portugal, China and India. The trade was primarily in ivory, slaves, spices and timber. By 1498 the Portuguese saw the island as having great potential for expanding its empire and in 1593, after a second attempt at colonization they built the huge Fort Jesus on the eastern side of Mombasa and eventually came to govern Mombasa for approximately thirty years. Prior to the Portuguese arrival Mombasa consisted of city states ruled by the Swahili people. But the island’s natives had neither sought nor enjoyed governance from Portugal and eventually requested assistance from the Sultan of Oman to chase them out. The Omans did exactly that in 1622 after capturing Fort Jesus from the Portuguese, which to the Swahilis great disappointment facilitated Omani colonization of Afrikas’s east coast and their control of lucrative trade, particularly the Slave Trade. After a settlement with the Omanis, Mombasa became a British protectorate in 1820 until Kenya gained its independence in 1963. Our driver to Takaungu accomplished the supposed seventy minute drive from Mombasa within forty minutes. From the very start of our drive I quickly came to appreciate why he was called Speedy; he drove as though he had great aspirations for the Dakar Rally and no doubt he would win on his first attempt! On that morning of our drive with Speedy I thought his driving talents were better suited for Germany’s autobahn superhighway where there are no potholes or speed limits (I later found out one of his other desires was to drive on an autobahn). I soon realized like the majority of drivers from my home country, St. Lucia, many of those in Mombasa believed they too were race car drivers. I sat upright clutching my fastened seatbelt in fear of an imminent accident all the way to the village. Thankfully, we arrived in Takaungu without ‘Speedy’ and his counterparts colliding with each other. I arrived in Takaungu to satellite dishes propped on houses with thatched roofs and galvanized alike. The toilet I was told that would be an outside pit was no less than a flush one installed in a modern tiled bathroom. Of course, this is not to say that others in the village did not have pit toilets; they did. And thank goodness for hanging ceiling fans! On days that I thought the Afrikan heat was out to prove how hot Kenya can really get I escaped into the house to the luxury of ceiling fans. Life in Takaungu truly was relaxed. 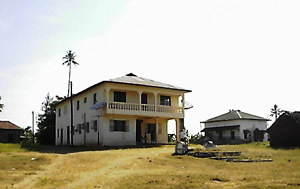 Two storey house similar to the best in the Caribbean. >Yes, there was the expected poverty that has come to be associated with Afrika but it seemed to be accepted without stress. The villagers, I was told, lived for today and left tomorrow in the hands of Allah. If a villager comes into the good fortune of extra money he either spends it all with friends or he might quit working until all the money has been used and give no heed to the most likely fact that there will be a tomorrow; no need to work unnecessarily when money is already at hand. Shop owners or vendors sell their goods at a minimum profit margin. They do not believe in the practice of fattening one’s pockets at the expense of others when only meeting the basic needs is necessary to live. The former European so-called “civilizers” of the country would be disappointed that these Afrikans did not inherit their penchant for the mighty dollar. But if there was one thing that the colonizers left with Mombasa was their 4 p.m. drinking of hot beverages; from the British it was tea and from the Arabians, coffee. In Takaungu, the Coastal Lowlands, tea leaves are boiled with spices such as cinnamon, ginger and cardamom, which is drunk either black or with milk. The addition of spices is the influence of another culture, the Indians—those from India (not the so-called “Indians” that Columbus ignorantly believed he “discovered” in the Antilles). The Indian culture arrived in Kenya when the British brought the natives of India as “labourers” (I suspect the Indians would agree the proper term was “slavish labourers”). In the Highlands of south-western Kenya, where tea is grown, they would say that the Lowlanders have no idea how tea was supposed to be drunk, which to them should be boiled with milk without water or anything else added. Don’t be mistaken, it was only the practise of ‘teatime’ that the British left behind, not the crop. Regardless how common the term “fine English tea”, English country—England, has never grown tea; it is imported from countries including Kenya and India. The other well appreciated universal beverage in Kenya is coffee. After leaving mosques from mid-afternoon prayers at 3:30 the Arabs settlers on the Mombasa coast used to congregate in small groups to enjoy tiny cups of potently brewed coffee. The practice still continues like a well-established ritual similarly done in Turkey and other Arab countries. Again, “Turkish coffee” does not refer to home grown coffee from Turkey; it is instead a Turkish style of serving coffee with its grounds while the coffee itself is imported from Ethiopia—where coffee originated and Ethiopia’s is still regarded as the best in the world. Turkey grows coffee no more than England grows tea. Kenya’s cultural inheritances go much further than its culinary habits; its coastal regions have some of the most interesting cultural mixes.